"Genocides: Forms, Causes and Consequences,"
Section: "Genocide, Memory and Identity"
These are my notes for an oral presentation that lasted about 20 minutes. I do not read my notes, but speak extemporaneously. I allotted about 2 minutes each for sections 1, 2, 3, and 6; 3 each for sections 4 & 5, and 6 minutes for the 7th section. I ended up taking more time for section 5 and less for 7. Please notify me (by e-mail, above) before citing. I would like to know the nature of your publication, and include a reference to it on this page. My talk today is not about what has been or is, but offers reflections on what should be. Namely: How should we remember genocide? What research should we conduct about genocide? What memorials and commemorative ceremonies should we have for it? How should we design our museums and memorial sites about it? What should we, collectively, know about it? What should we, as scholar-teachers, teach about it? What goals do we want to achieve when teaching about genocide? What should our students learn, how should they change by knowing about genocides? "Should" implies an ethical question of right and wrong, good and bad. Indeed, the teaching goals I'm talking about are moral ones. Take the categorical imperative by Yehuda Bauer, inscribed at the US Holocaust Museum in Washington: "Thou shalt not be a victim. Thou shalt not be a perpetrator. Above all, thou shalt not be a bystander." The devil is in the detail, in that word "potential:"
How do we know who is ever going to be in a situation of being a perpetrator, victim or bystander? We don't. And it doesn't really matter, since our student audience is diverse. Although we might sometimes know a likely group (or just go by the history of that group, e.g. Germans as perpetrators, Jews as victims, US-Americans as bystanders), the basic tenet of equality of education forces us to address all students equally. Think of teaching about genocide at a Jewish school in Berlin to mixed classes including non-Jewish Germans and US-American Jews. HOW to recognize when you are a victim and should fight back, or whether you are the perpetrator and should curb your aggression, or whether what you are witnissing is genocide. This depends on the context, the situation, the perspective each participant has. Example: US argues it is a (potential) victim in attacking Taliban in Afghanistan and Saddam Hussein's regime in Iraq. Most of the world sees at least the latter situation the other way around. OR: When will a bystander's intervention make matters worse, and when will it improve them? Example: Was Tony Blair right to join Bush in Iraq, or was Schröder right to refuse? If Kerry had been elected US president, would Schröder have been obligated to join the US? We don't know. It depends on assumptions we make about the causes of the situation. Another example of differing perspectives is posed by causality in human motivation. For example: Why did a specific perpetrator participate in genocide? -Because he was ideologically preconditioned to hate or fear his victims? -Because he thought himself unable to disobey orders to kill? -Because he felt obligated to his fellow executioners involved in the task of murder? -Because of some combination of the above? In any case, each motivation implies different lessons for preventing the development of future perpetrators. The same issue arises when figuring out why people become victims or behave as bystanders. being able to see a situation from multiple perspectives. These are lessons--skills actually--that (I think) should be taught in ALL historical instruction, not just when teaching about genocide. There are multiple "right" answers, not just one--hence my contention that we can't have absolute certainty in answering ethical questions. even the context depends on one's point of view. In fact, since genocide can often be highly politically charged, these skills might better be taught with more neutral material first, and perhaps later applied to genocidal situations. So far I've only been talking about individuals, but I really want to talk about collective identities, that is, how whole groups and even societies see themselves and behave. This is both easier and more problematic. It is easier because in a collectivity, we may be better able to discern whether that whole group is structurally situated to be perpetrators, victims, or bystanders. Of course some members will diverge from the norm, but in aggregate the collectivity carries out one basic, primary role. In any case, I think powerholding is the key. Only more powerful collectivites can become perpetrators, only less powerful ones can be victims. But, for example in the Israel-Palestinian question, even power is a matter of perspective. Israel--or at least Israeli hawks--see Israel as being much less powerful than its Arab neighbors. It is more problematic because we have to assume that a collectivity, a society for example, or a state, has a coherent identity and acts as a whole. In reality, genocide might be implemented by a small but powerful and perhaps manipulative elite. For example: it would be hard to argue that a majority of the US population supported Bush junior's initial invasion of Iraq, but the collectivity as a whole certainly carried it out. So let me make the assumption that a collectivity's actions subsume differences between individuals within itself. I note that Jürgen Habermas has addressed this issue on a theoretical level, in an essay he published in 1976, titled "Können komplexe Gesellschaften eine vernünftige Identität ausbilden?" --"Can complex societies develop a rational identity?" Even to pose this question presumes that whole societies can have an identity. For the sake of my argument, let's presume that they do. Where does this leave us? Today I will outline a taxonomy, a categorization of moral stages, and explore some of their implications for remembering and teaching about genocide. 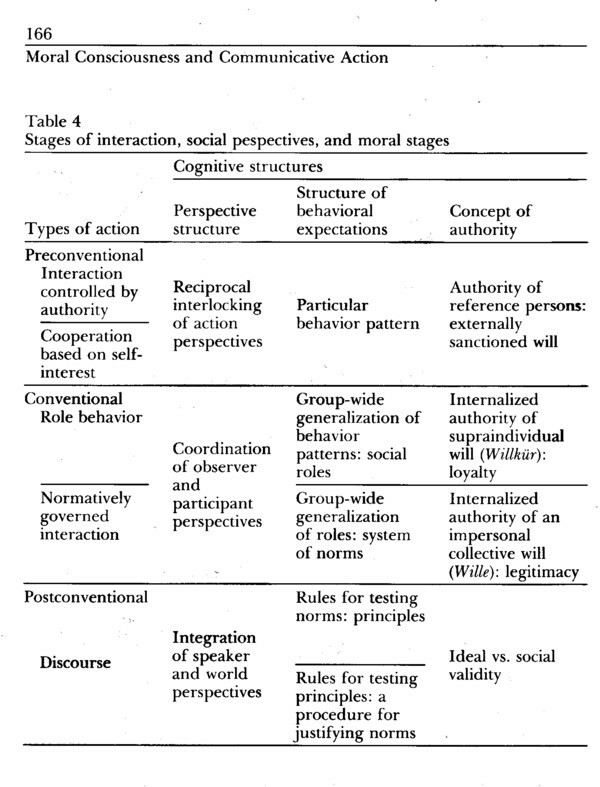 This is a taxonomy that Habermas has discussed at length in several essays. He links his discourse ethics to stages of moral development taken from child psychology. I'll read you some quotations from his essay that started the Historians' Debate in 1986, "A Kind of Settlement of Damages" -- "Eine Art Schadensabwicklung". I think most commentators and even most participants in the debate missed an important point: Habermas was not only attacking the validity of Nolte, Stürmer, Hillgruber et al's contentions, but pointing out their role in a social-educational context. I think Habermas's attention to the social-educational effects also explains why he held the laudatio for Danny Goldhagen when he received the Democracy Peace Prize. It was not so much the content of Goldhagen's history, but the role he played in sparking public debate. In any case, Habermas describes how, in the second half of the 19th century, German historians saw their job as an ideological contribution to stabilizing the kleindeutsches Reich. "means the end of a closed understanding of history and precludes any conception of history that might be prescribed by government historians. The unavoidable pluralism of perspectives is a reflection of the structure of open societies. This pluralism provides us with the opportunity to more clearly understand out own identity-forming traditions and their ambivalences. Precisely this is necessary for a critical appropriation of ambivalent traditions and to shape a historical consciousness that is as incompatible with closed and organic images of history as it is with all forms of conventional identity." Note how he links "closed images of history" with "conventional identity." He goes on to link open images of history with what he calls postconventional identity"
to the degree that these things are true we can speak of evidence for the formation of a postconventional identity." In a word: genocide, the Holocaust embodied by Auschwitz, was finally able to move West German society from the preconventional to the postconventional end of a "conventional" moral identity. (Goldhagen's argument is similar: post-1945 West Germany is fundamentally different. What do these terms mean, conventional, postconventional identity, and what do they imply about remembering genocides, about how and what we teach about genocides? For completeness' sake, let me begin by describing preconventional morality. Basically, "an eye for an eye." Laws merely exist, no need for agreement or justification. What is right is what meets one's own interests and needs, and letting others do the same. Motivation is doing right is to serve one's own needs when one recognizes that others must do the same. living up to the expectations of others, having good motives, keeping mutual relationships, maintaining trust, loyalty, respect and gratitude. This involves being able to see from one's own collectivity's overall perspective. At a more advanced stage conventional morality involves doing one's duty in society, upholding the social order, and contributing to the society, group, or institution. Note that the maintenance of the institution or society is seen as an end in itself, without regard for other institutions or societies. 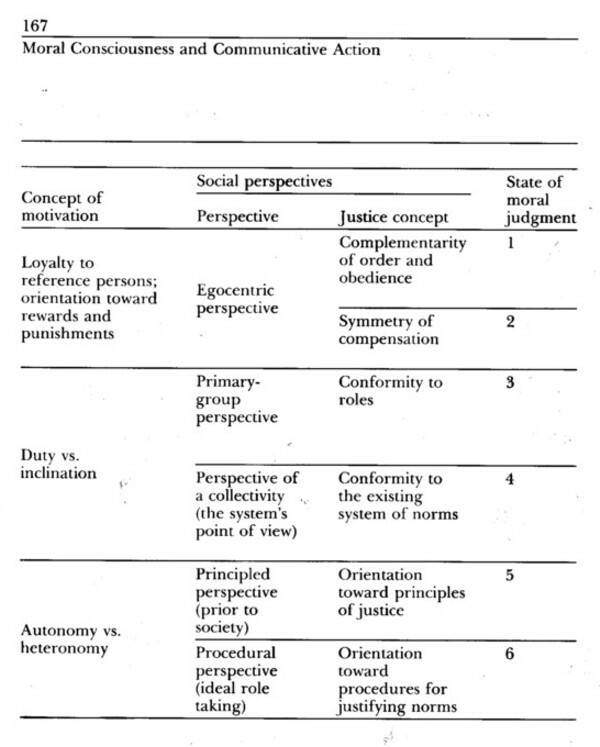 postconventional morality is universalistic, open, and inclusive also of the perspectives of other groups. Right is derived from general principles that can apply to all, not specific codified rules. It involves being aware of and respecting a variety of values and opinions. It requires understanding that most values and rules are relative to one's group (that is, that they are conventional). Motivation for doing right is the insight in the necessity of following rules that are for the benefit of all--"the greatest good for the greatest number." I would like to note as an aside that I find this last statement problematic, and that it has been subjected to cogent critiques notably from a gendered perspective. In studies involving girls as well as boys, women as well as men, it becomes obvious that some notion of helping someone, or at least not harming anyone, is indeed part of a universalist ethic as well. Also, Habermas argues that the 3 stages are "entwicklungslogisch"--they require passing through the hierarchical sequence in order. I think that is false as well, since, for instance, small children exhibit features of postconventional morality. Also regression is possible, certainly for collectivities. My central goal today is to suggest answers to the question: How can remembering genocide, teaching about aspects of genocide, contribute to the progression movement from one moral stage to another? Summary. What do we have so far? Three moral stages with different horizons of identification, like concentric circles. 1. at the center an individual with desires and needs interacting with other individuals. 2. around that person a group of family and friends, or some larger closed community (might be defined by ethnicity or culture). 3. around that a universe of humanity or even living things (animals, ecosystem). A willingness to accept that whole groups or societies have a coherent enough identity that they can, for the sake of this analysis, be treated like an individual. Thus, just as we can determine that a maturing infant, child and young adult can be taught to expand her or his moral horizon, we can postulate that a group, institution or whole society can learn to do the same. -only a "mature" society will be ready for such lessons. For example, security and the rule of law must be firmly established, that is, what the Germans call Rechtssicherheit. Many individuals, especially powerholding elites, but also social institutions, must be practiced in following rules, in seeing and respecting perspectives other than their own. Thus lessons aiming at genocide prevention will be very different in a society ruled by warlords using direct force, than in a civil society with traditions of self-sacrifice and rule abidance. How do we pick the lessons and values to teach? On an individual level: according to the age, maturity or life experience of our students. On an institutional or social level: according to the moral stage at which our institution or society is. In the 1970s Alltagsgeschichte revealed how much essentially every German did indeed know: the end of the myth of ignorance. But backsliding: the recent discussions of the Vertriebenenzentrum and the Luftkriegsdebatte -- Germans as refugees (or: other Europeans as well?) and victims of Allied bombings. Since the 1990s: signs of public recognition of non-Aryan victims, and Germans as perpetrators. -consensus to erect the "Memorial to the Murdered Jews of Europe"
What does this imply for teaching the teaching of genocide? Start with morally simple lessons. -prevent them from being forcibly taken away. That is, neither be a victim nor feel like one, recognize the options that you have and use them. -accept and value the diversity of perspectives within your own collective. Does that mean that a US citizen opposing our invasion of Iraq should support the collective's decision to intervene? No: there are indeed valid and invalid perspectives, but common recognition of the whole situation is necessary. First there is a need to agree on the "facts" (were there WMD, was Saddam an immediate threat). BUT (principle of appropriateness): ONLY after you have properly assessed the situation and used power relations to determine who is the victim, who the perpetrator, and what kind of intervention is most likely to be effective.